See the previous post on election monitors accusing critics of political terrorism here. See the first post on electoral irregularities here. 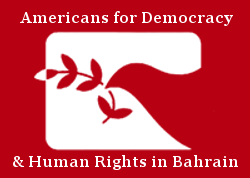 On 13 November 2018, Bahraini authorities arrested former Member of Parliament Ali Rashed al-Asheeri in relation to tweets that the government deemed “critical of the country’s upcoming parliamentary elections.” Al-Asheeri’s tweets argued for individuals to boycott the 24 November elections in Bahrain, seeing as they will be neither free nor fair due to the closure of civil and political space in the kingdom. Bahraini authorities said al-Asheeri’s tweets were designed to “hamper the democratic process,” despite the fact that the Bahraini government itself has hindered the democratic process by jailing the opposition and suppressing dissent. Al-Asheeri is not the first individual to speak out about boycotting the elections. Just last month, Ali al-Aswad, another former Member of Parliament, also called to boycott the elections. Both men belonged to the largest opposition group in Bahrain, Al-Wefaq – a political society which has since been permanently dissolved by the government. Meanwhile, as the government has dissolved opposition groups, all individuals who have ever belonged to a dissolved opposition society have been banned from seeking or holding elected office in the kingdom. The former Secretary-General of Al-Wefaq, Sheikh Ali Salman, was even sentenced to life in prison this month on new spurious espionage charges, further stressing the level of crackdown against the opposition in Bahrain. 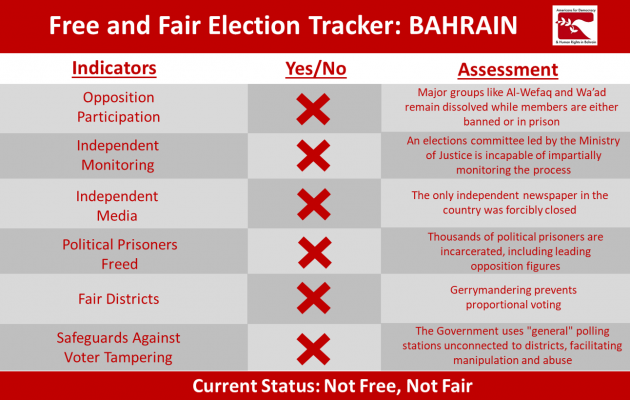 In addition to restrictions on election participation and the imprisonment of leading opposition figures, there is also concern that Bahrain’s electoral system lacks independent, objective oversight mechanisms. In October, one of the approved election monitoring groups, the Bahrain Human Rights Watch Society, actually decried opposition forces and compared them to terrorists in an official government newspaper. The organization, which is comprised of government officials, masquerades as independent observer of human rights issues in the country. With members of the opposition unable to fully participate in the elections and individuals at risk of imprisonment for boycotting it, the Bahraini government has effectively silenced civil society’s input and ensured elections will be neither free nor fair.